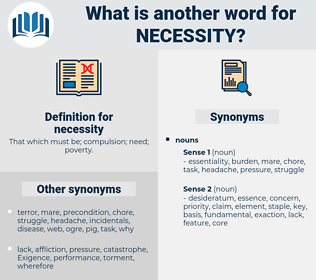 What is another word for necessity? That which must be; compulsion; need; poverty. Criteria, dictates, indispensable, desirability, prerequisite, precondition, obligation, necessary, appropriateness, requisite, Advisability. imperative, inevitability, need, needs, indispensability, urgency, requirement, significance. fortuity, dubiousness, possibility, surplusage, luxury, choice, uncertainty, Nonnecessity, richness, contingency, affluence, freedom, wealthiness, wealth, surplus, comfort, option, doubtfulness, prosperity, opulence, frill, doubt. I shall regret it, but necessity has no law. 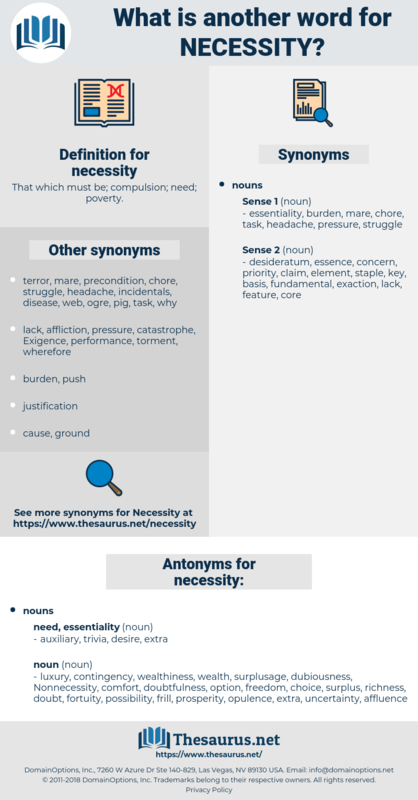 There's scarcely necessity for so much. nicety, naughty, nast, nonaged, naught, nauseated, naked eye, nonionised, nictate, no-good, naked, nonunionized, night, nonionized, necessitate, nakedwood, nose out, Nejd, Najd, nonunionised, nonskid, nicad, negociate, Newgate, ningishzida, nsaid, Naha City, necked, nouakchott, Neem Seed, nine-sided, nanny-goat, nosed, nought, nonsweet, negate, newscast, nasty, nest, next, newssheet, nugget, nightie, NIST, nictitate, nighted, noctua, nauseate, necktie, nougat, noctuid, noctuidae, negotiate, nighest.